The 2012 edition of the Festival of the Seven Moles will be held in Oaxaca city from July 19 to 31. Over 50 Oaxaca restaurants will participate in this year’s festival, which will include tastings, conferences and lectures including: “Mi visión de los moles” (My view of mole) by Abigail Mendoza, “Los Chiles endémicos de Oaxaca” (Oaxaca’s endemic chiles) by Porfirio Lopez, and “Los moles de Oaxaca” (Oaxaca’s moles) by chef Ricardo Muñoz, among others. Oaxaca is renowned not only for its vibrant culture and traditions, but also for its culinary heritage. The mole festival will be a great opportunity for visitors in town for the Guelaguetza to discover more about Oaxacan cuisine. 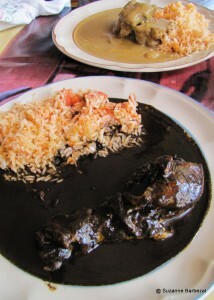 Learn more about mole and other foods to sample in Oaxaca: Oaxacan Food: 10 Foods and Drinks to Try in Oaxaca. See info about more festivals and events in Oaxaca during the Guelaguetza!